The Belt and Road initiative (B&R) has entered a new development stage. Heads of state and government from 29 foreign countries attended the Belt and Road Forum for International Cooperation in Beijing on May 14 and 15. President Xi Jinping made a keynote speech, proposing the B&R's peaceful and prosperous vision and China's missions as well. A communiqué was released at the end of the summit as well as several trade and project agreements between China and other countries along the Belt and Road were signed. Given that globalization is currently facing challenges, the positive effects of the forum indicate globalization remains vital, and developing economies particularly hope to enhance international trade and attract investment to develop their economic growth. Notably, the US and Japan both sent their delegations to the forum. Japan also expressed interest in the B&R and the Asian Infrastructure Investment Bank (AIIB) projects. Not long ago, US President Trump announced his intention to abolish the Trans-Pacific Partnership Agreement (TPP) and the US Rebalancing to Asia strategy, both of which were started by former president Barack Obama. Despite being a major economic trade power in the Pacific Region, China was excluded from the TPP. Conversely, the B&R is not an exclusionary plan. The TPP is out now but B&R is in. Since the B&R was raised, it is making headway. More and more countries and international organizations are subsequently willing to accept and participate in this initiative. While the 2016 election brought change to the administration in the US, it is too political to consider that administration change alone caused the B&R and TPP to diverge in different directions. Globalization cannot be seen as a zero-sum game and must be seen as win-win cooperation between different countries. There is widespread discontent toward globalization among many American workers, but no evidence clearly shows international trade alone hurts a developed economy. China is one of the major participants in today's globalization. As reported, in the past a couple of years China has invested more than $50 billion, participated in building 56 economic and trade cooperation zones, and created 180,000 jobs along Belt and Road countries. The B&R development can provide solutions and opportunities for China's further economic growth, thus benefiting the country while helping others. Any country can gain power after developing its economy while not intervening in the internal affairs of other countries. Thanks to the success of the B&R, China can also improve its international status and geopolitical influence. The initiative is an ambitious plan and has raised concerns by skeptics who are concerned about China placing itself in the centre among those Belt and Road countries. Obama said China wanted to set the rules of international trade. The B&R is an economic cooperative plan, under which China and other different countries develop bilateral trade and finance relations while building up closer economic relations with each other. Actually, the current US administration also considers replacing some existing multilateral treaties with different bilateral trade treaties. The B&R presents new opportunities for engagement and partnership. 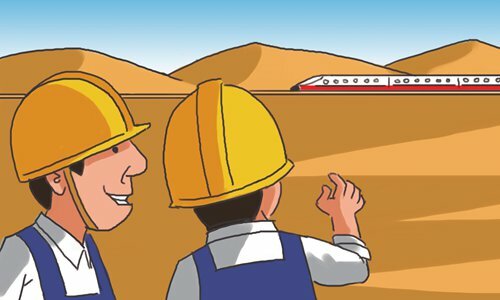 Certainly, some Belt and Road countries can show interest in multilateral economic cooperative in the future but for now the B&R remains the most viable option. The B&R is not a hegemonic plan and China is just a sponsor and active player under the initiative.